We offer American Heart Association classes in Southern California. All our instructors are AHA certified and include Physicians, Nurses and Paramedics. Private training and offsite classes are available. Register for a class online or contact us for an appointment. Established in 1992, authorized by American Heart Association (AHA), Lifeline Healthcare Education offers a range of classes and courses including CPR, AED, First Aid certification, Basic Life Support – BLS certification, Advanced Cardiac Life Support – ACLS certification, Pediatric Advanced Life Support – PALS certification, Neonatal Resuscitation Program – NRP certification. Our class schedule provides flexibility for those taking courses for the first time, or renewing their certification. Our main training facility is located in Mission Viejo, California where we offer classes to all of Orange County. All of our instructors are AHA certified and include Physicians, Nurses and Paramedics. Private classes can be arranged to accommodate your specific needs. We also offer individual or group training at your facility in Orange County and Southern California. Our clients include healthcare or medical professionals and providers; Nurses, Paramedics, Physicians; Parents and Foster Parents and Daycare; School Teachers and Coaches; businesses and individuals. 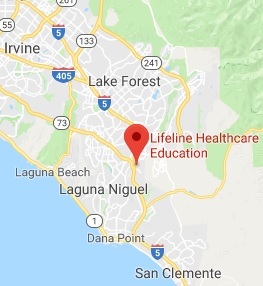 South Orange County, North Orange County, Aliso Viejo, Anaheim, Brea, Buena Park, Capistrano Beach, Corona Del Mar, Costa Mesa, Cypress, Dana Point, Foothill Ranch, Fountain Valley,, Fullerton, Garden Grove, Huntington Beach, Irvine, La Habra, La Palma, Ladera Ranch, Laguna Beach, Laguna Hills, Laguna Niguel, Laguna Woods, Lake Forest, Los Alamitos, Midway City, Mission Viejo, Newport Beach, Newport Coast, Orange, Placentia, Rancho Santa Margarita, San Clemente, San Juan Capistrano, Santa Ana, Seal Beach, Silverado, Stanton, Sunset Beach, Surfside, Trabuco Canyon, Tustin, Villa Park, Westminster, Yorba Linda.